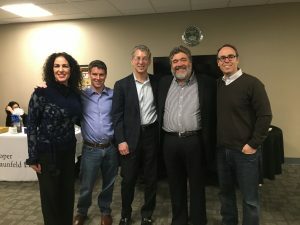 The Philadelphia-Israel Chamber of Commerce held a technology themed investment event on Wednesday, February 1st at Susquehanna Growth Equity, LLC. Keynote speaker, Jonathan Medved, Founder and CEO of OurCrowd, initiated discussions on hot topics such as cyber security, cloud communication, digital health, virtual reality, machine learning, ag-tech and many other high interest technological areas of advancement. Guests in attendance were also welcomed to join the discussion during a fireside chat with host and moderator, Amir Goldman, Managing Director of Susquehanna Growth Equity, LLC, Bob Adelson, Managing Partner from Osage Venture Partners as well as keynote speaker Jonathan Medved. Click here for photos and videos of this exciting and valuable PICC program.